Cold, wet and tired, we had finally arrived in Charleston in late November, five weeks after leaving the Chesapeake. The ebb current in the Ashley River was running against the building easterly wind, and the harbor was a seething mass of waves and whitecaps. We were lucky to get a slip at all without a reservation this time of year. The marina asked if a 50-amp receptacle would be okay—it was all they had available and we were in no position to turn it down. Besides, we had a 50-amp adapter onboard. 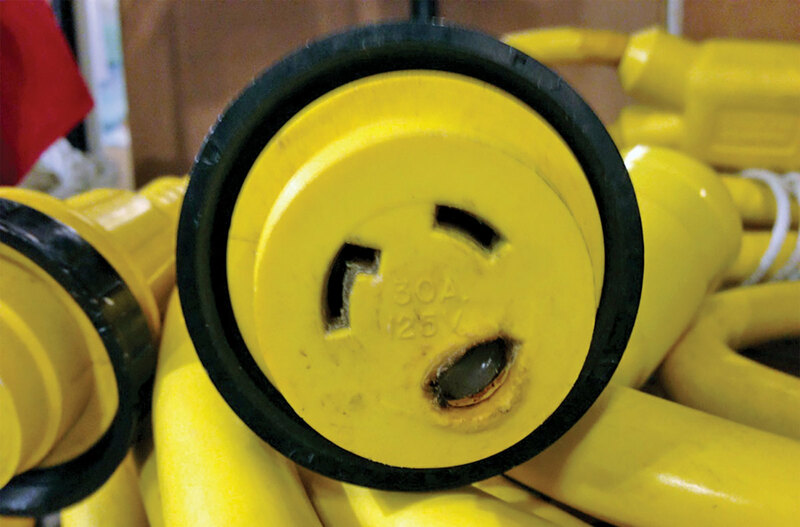 We pulled into our assigned slip, took the adapter to the power pedestal, flipped open the receptacle lid and were greeted by a power receptacle that had clearly suffered from heat damage (Photo 1). There was a moment of panic as we contemplated a cold, rainy night without power. Despite assurances from the dock hand that the receptacle had been fixed, I was not going to hook up to that pedestal. There was a 30-amp outlet available at a nearby slip, so we plugged in there. Crisis averted, at least for one night. Granted, the damage suffered by the power receptacle in question was excessive, but it shows why you must inspect every receptacle you plug into. Have you ever plugged into an outlet where one of the receptacle’s blade sockets is scorched brown and partly melted? Have you noticed burned or melted plastic on your cord end? (Photo 2). These are all signs of trouble. A damaged cord is inevitable, and a fire is possible. 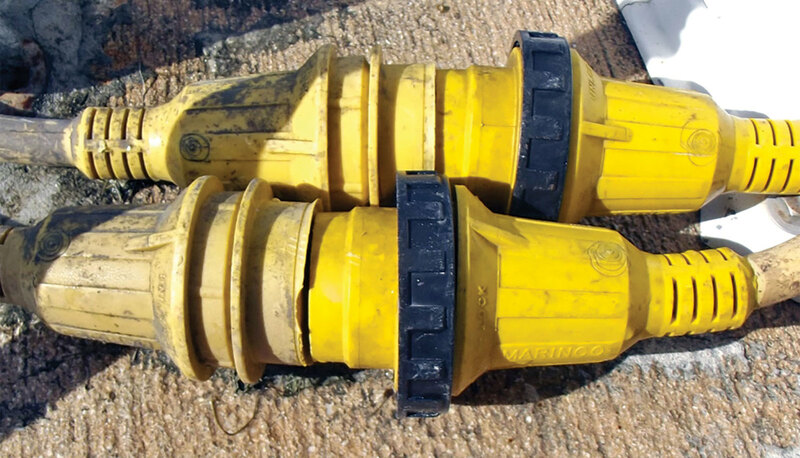 Shore-power cords have been fingered as the cause of a number of marina fires. Such fires often occur in winter when heating requirements put substantial loads on electrical systems. As current is drawn through the cord connectors it meets resistance. If all connections and contacts are clean and tight, the resistance is hardly measurable and not noticeable. If, however, contacts are not tight or if connections are corroded, the circuit will have resistance, and this will create heat. This burns and melts the plastic and loosens the contact screws. If it goes unnoticed, the heat will build up until the outlet smolders and may burst into flame. Such fires may occur in winter, but the damage begins in the summer. Have you ever dropped your cord end in the water? It happens more often that we care to admit. We shake the water off and plug it in anyway. The residual saltwater around the blades is transferred to the power post receptacle. As the water dries out, salt crystals remain. These cause corrosion (Photo 3). Corrosion is like friction in the electrical circuit. It causes resistance, resistance creates heat, and the corroded connector heats up. Have you ever connected or disconnected your power cord without turning off the power at the breaker? If so, each time you do this you draw an arc which burns a spot on both the receptacle and blade. Arcing burns are not conductive and also cause resistance, and therefore heat, in the connection. The heating and cooling can loosen the screws holding the wires in the dock receptacle. Loose wires mean poor connections, high-resistance connections and more heat. Over time corrosion and arcing slowly but surely degrade the electrical contacts. Your first indication of something going on a cord end that feels warm to the touch. If the connections are clean, the end of the cord will run at the ambient temperature of the surrounding material. An infrared thermometer is the best tool to monitor the connection (you can buy one of these online for as little as $20). As time goes by the corrosion gets worse, and the resistance in the cord end climbs to the point that the receptacle is overheated and damaged. The corrosion-resistance-heat-damage cycle is like an infectious disease. A corroded and damaged cord is plugged into a power post. It overheats and damages the receptacle. 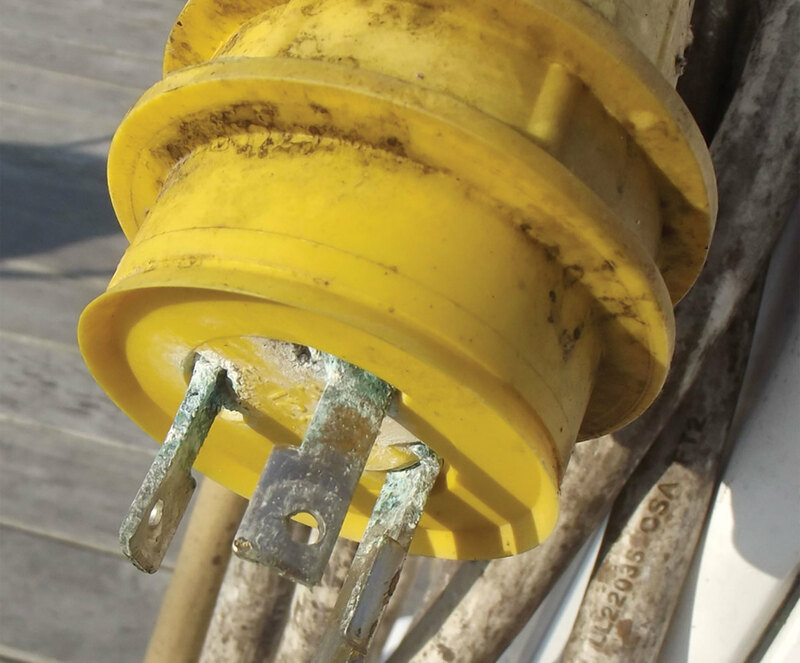 Over time, as boats come and go, several corroded cord plugs will be connected to the receptacle. Eventually the receptacle itself is damaged. You plug in to the receptacle and the resistance in the receptacle causes heat that is transferred to your cord and damages your plug. Your damaged plug goes to another receptacle, and the disease is passed along. We have been discussing damage to the dock end of your power cord. The scenario is much worse when the corrosion gets started on the boat end of the cord. In this case the damage is completely self-inflicted. 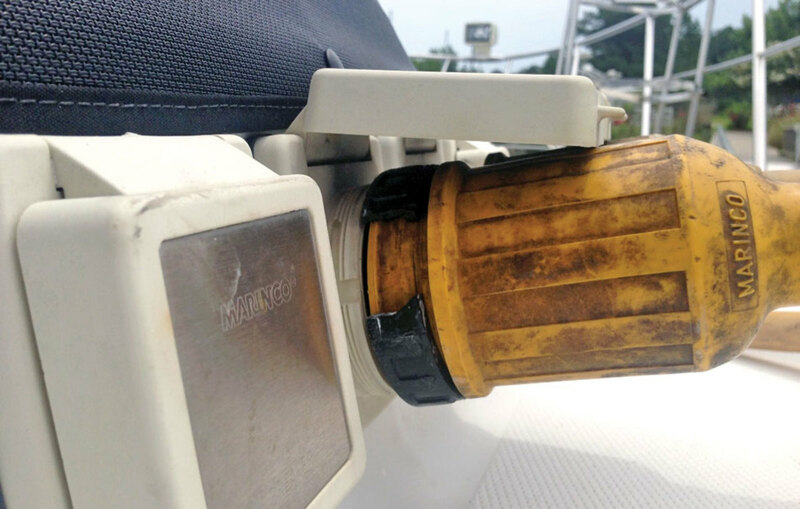 Unlike the dock receptacle, boat inlets are exposed to weather and spray. When you take the power cord off to go for a sail, do you close and secure the cap on the hull inlet? 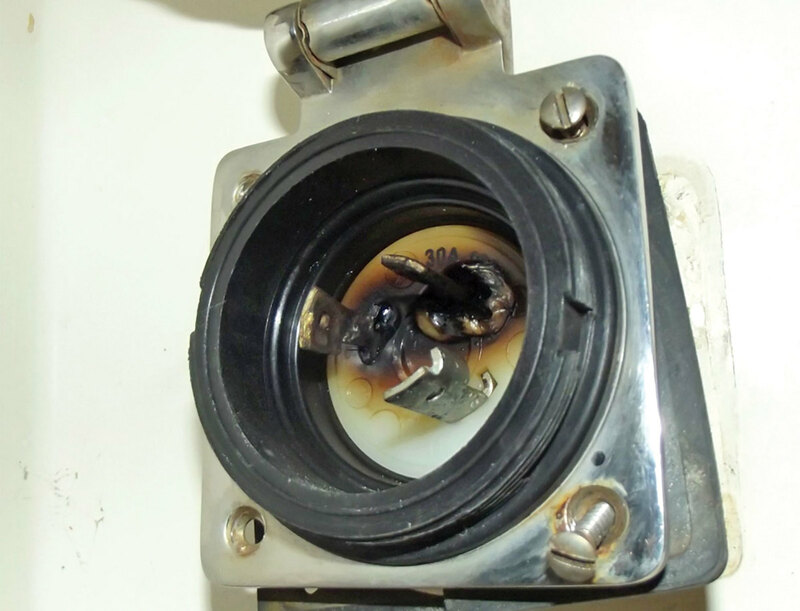 Power cords come with locking rings which many of us either don’t use or remove because they are “in the way.” A significant cause of corrosion is failure to use a locking ring on the hull inlet. 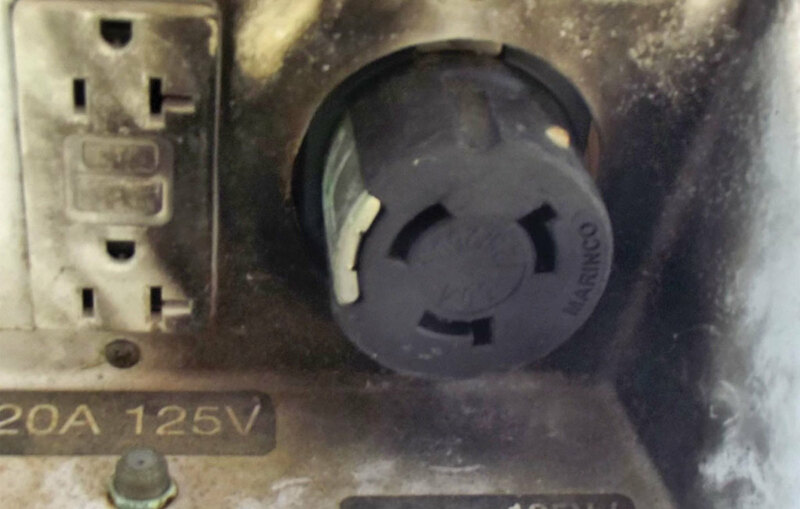 Whereas a damaged power post may destroy the shore end of your cord, when the failure is on the boat end, the heat, smoke and fire are inside your boat (Photo 4). When you get ready to plug into a power pedestal, be sure to switch the breakers off at the shore power post and at your boat’s AC panel. Then look at the shore power pedestal. If any part of the blade socket or contact socket looks burned or melted, talk to the marina about using a different pedestal. Always spray a receptacle with CR6-56 before you plug in to drive out moisture and fight corrosion on the receptacle and on your cord end. When you use an adapter at a power pedestal, use the connector ring and lock the cable to the adapter so you don’t leave a gap. The gap allows water to get into the connection once more allowing corrosion to get started in your power circuit (Photo 5). 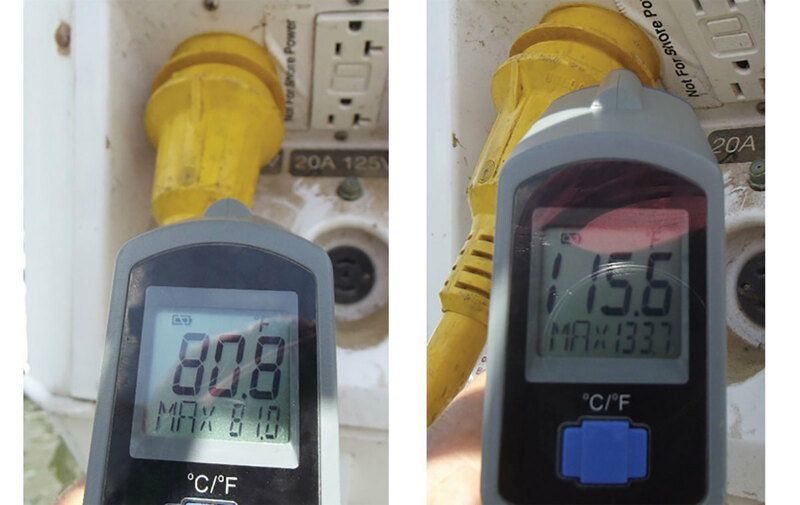 Check the temperature of your cord ends when you are drawing heavy loads, for instance, if you have a water heater and an air conditioner or a heater running. If the electrical connection is 2 degrees above ambient temperature, all is well. If the temperature is more than 10 degreees above ambient, a problem has started. If it is 20 degrees above ambient it is time to act. (Photos 6A & 6B). Always turn off the power before connecting or disconnecting your cord. Inspect dockside power receptacles for damage before you plug in. If the cord end falls into the water, wash it with freshwater, dry it and then spray it with a water-dispersing spray such as CRC 6-56. Spray corrosion-blocking spray into the blade sockets every time you plug into a new power post. Use dielectric grease on the hull inlet blades. Always use the locking ring at the hull inlet and on any adapter fitting. Always screw the hull inlet cover tight when the cord is unplugged from the boat. Check the temperature of the cord ends several times a year.